The shape of an air mass can exert a powerful influence on its behavior. Depending on the arrangement and orientation of individual currents within the air mass, it may take the form of a tornado, a hurricane, or an ordinary front, with dramatically different effects. 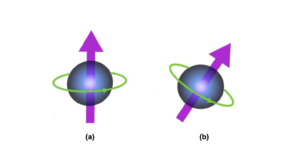 Similarly, in most magnetic materials, the magnetic moments or spins of individual atoms are aligned parallel to one another and point in the same direction. But in two special magnetic “textures,” called skyrmions and antiskyrmions, the spins are arranged in a structure containing multiple spirals, as shown above. Skyrmions and antiskyrmions differ in their symmetry, as depicted in Fig. 1. Since all memory is based on a binary code—two different material states corresponding to “0” and “1,” respectively—the formation of skyrmions and antiskyrmions can be used to encode data in memory devices. Changing from one to the other requires a great deal of energy, like untying a very complicated knot, which makes these magnetic textures stable—a property that is important for data storage applications. And their compact size makes them especially useful for encoding information in high density—in other words, lots of data in a small space. But a few questions need to be answered before skyrmion-based technology can be used in your iPhone or other memory devices. First, why do these magnetic structures form in some materials and not others? How can we design a system where they will form? And how can we generate these structures on demand? We have learned that skyrmions form when the spins of adjacent atoms interact in a way that causes them to tilt, much as the earth’s axis is tilted with respect to its orbit around the sun (Fig. 2). This phenomenon, called spin canting, produces the spiral arrangement found in skyrmions and antiskyrmions. To generate skyrmions and antiskyrmions on demand, we first need to generate canted states. 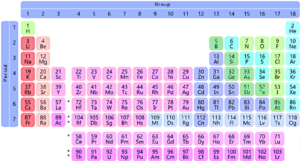 We know spin canting takes place in thin magnetic films containing transition metals, which include most of the elements in the middle of the periodic table (Fig. 3). Whether and how spin canting happens depends on the presence of atoms with a relatively large atomic number, as well as the arrangement of atoms in the material—a layer of platinum (Pt) in contact with a thin magnetic layer of cobalt (Co) works very well, for example. Spin canting is especially likely to occur where there is a boundary between dissimilar atomic arrangements (Fig. 4). 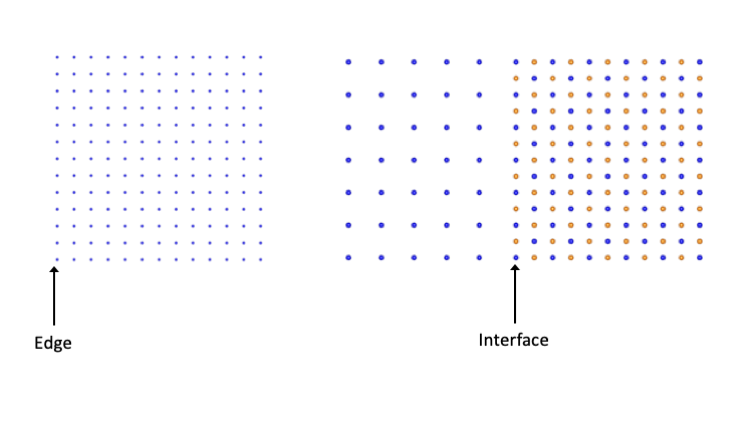 Edges, which are boundaries between the material and empty space, form because the material has finite size; interfaces, which are boundaries between materials with different atomic arrangements, form because even “pure” solids usually consist of multiple grains with different orientations. 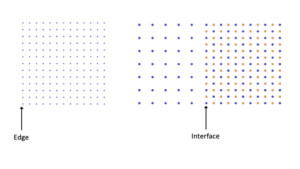 Interfaces also occur in composite materials that juxtapose two or more types of material with different atomic arrangements. So why and how does spin canting happen at edges and interfaces? When we immerse our material in a magnetic field, the spins tend to align parallel to that field, but they can’t abruptly change their orientation without costing a lot of energy. Because of this energy restriction, the spins tilt near the boundary. When we briefly decrease the strength of the magnetic field near the boundary, the spins on either side becomes unstable and start to rotate around their original orientation like a spinning top. This rotation influences adjacent atoms, propagating into the material until the magnetic field is brought back to its original strength. Through this process, a skyrmion-antiskyrmion pair is formed (Fig. 5). In order for magnetic textures to be useful in data storage, they must be stable, but we must also be able to change them on demand when the memory is written and re-written. The discovery that magnetic pulses in certain materials can create skyrmion-antiskyrmion pairs is an important step toward controlling the formation of magnetic textures in high-density memory devices. With the ability to arrange atoms and thus create complex spin textures like skyrmions or antiskyrmions, we can use these textures to read and write information in binary. Better still, this process requires only a quick magnetic pulse, consuming less energy than conventional magnetic memory, so the batteries of new iPhones could last longer without losing performance. Fig. 1 (Click to enlarge) Skyrmion and antiskyrmion configurations. The arrows show the in-plane components of the atomic spins (up or down and right or left, as you view the image). Since atoms exist in three-dimensional space, we use contrasting colors to indicate the out-of-plane component of the spins; bright pink means the spin is pointing out of the screen toward you, and bright yellow means it is pointing into the screen away from you. Fig. 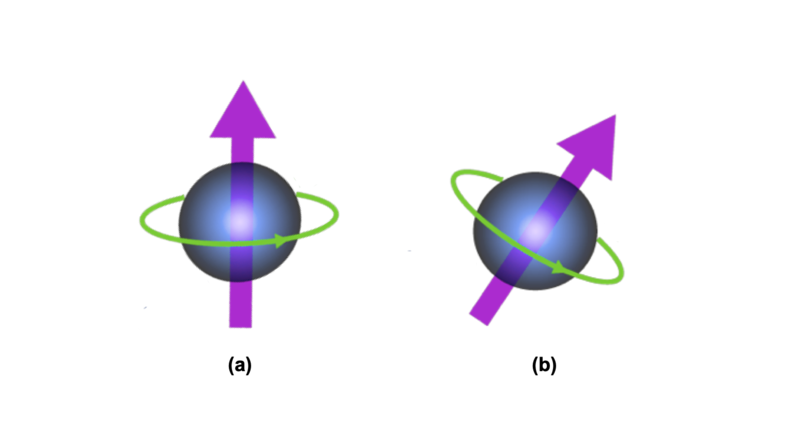 2 (Click to enlarge) A "spin up" electron in an (a) uncanted and (b) canted state. For a deeper explanation of what spin is and how we can detect it, check out the video below! Fig. 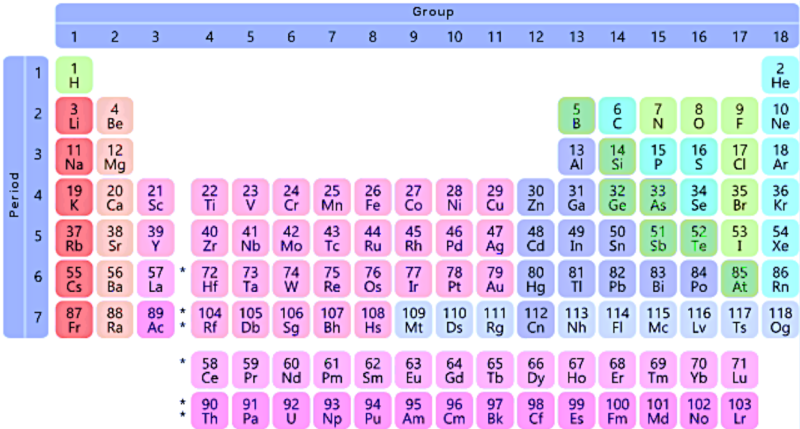 3 (Click to enlarge) Transition metals shown in pink. Fig. 4 (Click to enlarge) An edge occurs where atoms are adjacent to empty space. An interface occurs where atoms in one arrangement are adjacent to atoms in a different arrangement. Fig. 5 (Click to enlarge) Animation of a skyrmion-antiskyrmion pair produced near the interface between two magnets.